As island communities face these hardships, their inhabitants are responding actively – drawing on a long history of adaptation and traditional ecological knowledge to challenge prevailing modern orthodoxies and devise creative solutions for the future. Too often relegated to the category of victimhood, Pacific Islanders are in fact demonstrating resilience and innovation in the face of existential risks. This paper explores that trend through firsthand interviews with members of five island societies: Samoa, French Polynesia, Vanuatu, Fiji, and Hawaii. These individuals articulate the problems confronting the region, communicate the responses of their respective communities, and offer solutions toward local sustainability and, ultimately, survival. Nowhere is climate change more evident than in small island states, where entire populations are facing existential challenges – the very real prospect of full evacuation, dispersed resettlement, and potential cultural annihilation. Of these, many of the most threatened territories lie within the great expanse of the Pacific Ocean. Rising sea levels in the region will mean literal submersion for some islands, and the devastation of precious freshwater and biological resources for others. Perceiving the outlook to be bleak, increasing numbers of islanders are abandoning their homelands in search of a more secure future on foreign shores – the first climate refugees, in many cases. Others, meanwhile, are determined to hold their ground. Drawing on age-old traditions, leaders from different generations within this latter group have begun reimagining a local future – one that in many ways diverges from mainstream Western models. Rather than viewing climate change as heralding some ultimate societal collapse, these individuals are approaching the phenomenon as a challenge with – in some cases, for them – an anti-colonial silver lining: namely, the opportunity to restore sustainable cultures through indigenous knowledge and the renewal of ancestral values. Moreover, some see their societies as offering avenues of survival to the wider world – if it chooses to listen. Younger islanders, in particular, are stepping forward and proposing localized solutions tailored to the environments that their communities have known intimately for generations. The future is clearly far from golden, and the feelings of many islanders range from mixed to defeatist. The very fact that this critical discourse is being conducted at all among island communities, however, has not been widely represented in Western circles, which all too often characterize Pacific Islanders merely as helpless victims of climate change and other environmental threats beyond their control. This paper seeks to shed light on the developing situation at ground level, through the perspectives of people whose voices are generally unheard beyond Oceania: Pacific Islanders themselves. Drawing principally on firsthand interviews conducted with individuals from five island groups – Samoa, French Polynesia, Vanuatu, Fiji, and Hawaii – collectively representing the region’s geographic diversity, this account explores indigenous perceptions and responses to the acute crisis posed by contemporary climate change in the Pacific region. Samoa has for decades suffered the effects of climate change, especially in the form of increasingly frequent and intensive cyclones and other storms. A particularly devastating tsunami, arguably magnified by higher and more energetic seas, struck in 2009. This resulted in 150 deaths – an enormous loss relative to local population size – and caused widespread devastation, leaving many islanders homeless and traumatized. According to Carinnya Feaunati, a young Samoan architect, whole families have since had to relocate inland from their ancestral homes on the coast – a dislocation that has torn the social fabric of entire communities. In Samoan culture, the very notion of self is intimately connected to the site where families and forebears have lived; place thereby plays a vital role in personal identity. In this context, relocations inland mirror the state of Samoan culture. Loss of heritage, the sense of being cut off from family lineage in communities left behind, has engendered a parallel loss of social standing. “Those who have departed no longer possess the right to decisions in their ancestral home,” Feaunati noted; “every last bit of their family history has no relevance anymore because they have moved.” Meanwhile, those left behind in turn feel betrayed, fracturing relationships within the islands’ tight-knit communities. Feaunati attributes this destructive trend to growing fears of climate change. Other related shifts, while less dramatic, have likewise brought considerable hardship. The impact of immediate stresses on natural resources and local ecosystems, in particular, is increasingly evident. Mangroves – essential protective barriers in island ecology – have seen extensive damage in recent years due to sea level rise, while the infiltration of seawater has decimated species inhabiting those areas. For example, fish and crabs caught in affected waters today are considerably smaller than they were previously. Raised in a traditional Samoan family, Feaunati has witnessed firsthand the negative impacts of climate change on her home. Determined to act, she chose to become an architect in order to help her people structurally respond to the dramatic environmental changes increasingly affecting their way of life. Working together with a team, Feaunati has focused on devising new ways of adapting traditional Samoan house construction to withstand heightened storms and sea level rise – all while ensuring that local aesthetics and architectural traditions firmly rooted in the culture are kept alive. In this endeavor, she has made a point of consulting local elders to learn from their years of experience in the islands. They in turn have recounted a recent history of periodic cyclones or tsunamis forcing families to vacate dwellings near the sea and rebuild further inland. Through that extended interview process, Feaunati’s team was able to map out this narrative of internal migration. The repeated need to rebuild, due to necessary relocation inland, seems to represent a distinct shift for Samoans. Feaunati’s project seeks to ameliorate these dislocations by improving construction processes, erecting houses that are more resistant to extreme weather while simultaneously preserving and incorporating local building traditions. “How can you stop that practice of ‘rebuilding’ and actually rebuild…so that they can retain what they know?” The key, in her view, is applying and incorporating traditional methods, designs, and materials so as to retain cultural integrity – thereby sustainably preserving the culturally significant architecture of the islands for future generations. This effort is especially important for Feaunati, because young Samoans today are growing increasingly divorced from their heritage. “Children are becoming less and less willing to learn those traditional skills….The key [reason] why they don’t want to do it is because there is no money in it.” Historically, traditional Samoan carpenters, builders, and craftsmen would be paid in fine woven mats, food parcels, and other gifts, along with prestige. According to Feaunati, it was “an honorable thing to have this role, to have this knowledge and skill.” The modern consumer economy has changed this. 3,500 km to the west, in the smaller Marquesas Islands of French Polynesia, inhabitants have had no choice but to continue battling the sea. With no extended hinterland to fall back on, coastal communities there are especially vulnerable. They have borne the brunt of increasingly frequent cyclones and tropical storms, which have in turn seen the formerly abundant local fisheries severely depleted. The problems extend beyond basic subsistence. 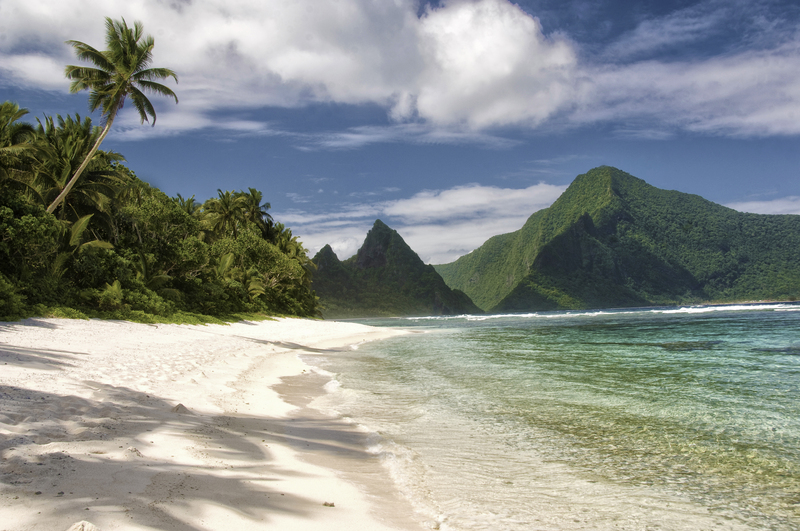 After tourism, the economy of French Polynesia is primarily based on the pearl trade, due to prevailing environmental conditions and the nature of the atolls in the region. Ocean acidification – another manifestation of global warming – has hit this activity particularly hard, as the phenomenon is highly detrimental to mother-of-pearl. As a result, this mainstay of the islands’ economy has suffered greatly. Sea-level rise poses yet another economic threat. The atolls of French Polynesia are flat islands – the highest elevations reach only two to three meters – essentially lying at sea level. Composed of coral, the atolls have long been used by locals to grow coconuts, which are then used to produce a wide variety of products. One of these is copra, another mainstay of the regional economy. Copra is the meat of the coconut, which once extracted is then pressed in order to obtain coconut oil – an essential ingredient in cosmetic products. Vanuatu: Adapting to the Inevitable? Across the Pacific, islanders are finding themselves in the same precarious boat. In the independent nation of Vanuatu, communities are also being hit hard by climate change. Sea-level rise there has inflicted the most damage, steadily eroding the coastline, flooding roads, and causing devastating saltwater inundation of precious cropland. Drought is yet another problem, with ever higher temperatures killing crops and upending the agricultural cycle. Shortages of water – that most vital of human necessities – have further compounded the situation on the islands. As ocean levels rise, seawater has progressively seeped underground, contaminating key freshwater resources. As a result, the population today is increasingly dependent on rainwater and water catchment. The current crisis has also led to growing tensions within island communities, stemming from increased uncertainties over natural resources and living conditions. This is an elemental concern, given the practical importance of maintaining good social relations on small islands. As Nihmei put it, traditionally “we work as a community, we live as a community, and we help each other.” The environmental stresses undercutting these historically close ties thereby threaten the tight-knit fabric of Vanuatuan society. In the face of these mounting challenges, the people Vanuatu have begun devising creative ways to adapt to their changed circumstances. Strategies have included constructing seawalls of cement, rocks, and dead coral to minimize coastal erosion; re-vegetating coastal foreshore areas; enhancing soil quality and resilience through composting and cultivating drought-resistant crops; and creating better methods for water storage. Special evacuation shelters, meanwhile – termed ‘hurricane houses’ – have also been constructed. Designed to withstand severe storms, these dwellings are made of traditional materials such as wild cane, coconut leaves, and bamboo, which are able to survive strong winds. Strategically planted trees provide further protection, serving as windbreaks around the islands’ villages. At the same time, Tuimoce believes that the current situation has also created new opportunities for Fijians to draw on their indigenous traditions to adapt and transition to more sustainably-oriented practices. As a sailor, to him the drua represents a prime example. “We can build canoes – bigger canoes – as a means of transportation from island to island,” combining “traditional and modern methods” to replace the current ships that rely on fossil fuels. The initiative to readopt the drua – a modernized incarnation of the original to accommodate the needs of Fijians today – is building on existing momentum. “There are a lot of projects going on in Fiji right now,” Tuimoce stated. Maintaining the older, more environmentally friendly ways of doing things is of great importance to Tuimoce. “That is happening in Fiji….In my village, we don’t even own an on-board motor. We go fishing, [and] we go from where we’re staying to town to do shopping, in our canoes.”  The rest of the world, he believes, can learn from their example. 5,000 km to the north, Hawaii occupies a very different category when it comes to resources and levels of development. As one of the wealthiest states in the world’s largest economy and foremost superpower, Hawaii is uniquely situated compared to its Pacific peers. Nevertheless, as an archipelago, it is similarly susceptible to global warming. Recognizing this, in 2014 the Hawaii Climate Adaptation Initiative Act was announced, stating that “Climate change is the paramount challenge of this century, posing both an urgent and long-term threat to the State’s economy, sustainability, security, and way of life.” Droughts, rising temperatures, and beach erosion in particular are expected to accelerate over the coming years – disruptions that will hit the islands’ indigenous population especially hard. Batangan regards the fundamental relationship between people and the natural world as broken – due principally, in her view, to a lack of awareness and understanding on the part of the former. “I think people know that we should care for the environment, that we shouldn’t litter and do these things. But I guess people don’t really see how climate change, or [other] effects on the environment, can actually directly affect them; and that’s kind of scary, because I don’t think – until something big happens – that people are going to really realize how much it can affect them.” Batangan attributes this attitude to a growing disconnect – shaped and encouraged by the values and lifestyles of mainstream society today – between humans and their environment. In the face of climate change and its attendant effects, inhabitants of the Pacific Islands are not sitting on their hands. Many islanders have shown great proactivity in confronting the new challenges facing their communities, and although responses certainly vary from place to place, the strong voices of these individuals stand out. They have also united around a common theme: namely, the necessity of looking after a shared natural home, due to both ecological necessity and a moral imperative. In their view, we as humans must remain a sustaining part of an environment that in turn sustains us – an age-old relationship of equal obligation, which today is in urgent need of rebalancing. Conching describes the notion thus: “the Hawaiian motto is ‘The life of the land is perpetuated in righteousness,’ or ‘Ua mau ke ea o ka ‘āina i ka pono.’ So basically, in order to perpetuate yourself, you have to perpetuate the land.” Or in Tuimoce’s words, “Do not disturb the ocean. Look after the ocean. It is a living thing that looks after you.” Each hope for a way forward that draws on the worldviews of indigenous peoples, which have often situated the environment front and center – in stark contrast to the dominating approaches of modern society. Pursuing this imperative, in their view, would entail redefining mainstream notions of the natural world – requiring us to reach back into our ancestral past to rediscover our interconnected relationship with the ecological support systems that sustain us, and reach forward to reimagine a more sustainable future for coming generations. As Tuimoce explained, “I sail around the world preaching the gospel of reviving tradition,” for him defined as “moving your paddle silently through the water” – a metaphor that epitomizes the need for rediscovering the less-ecologically destructive approaches of our past, and reimagining and reinventing them to suit the present and future needs of global society. In this vein, the islanders likewise assert the relevance and value of their own and other indigenous voices to the broader international discourse on climate change – not only as advisors, but as actors as well. In the blunt words of Feaunati, “indigenous people should not [only] be counted as consultants…they should be making the decisions.” In other words, there is a need for greater global recognition of what indigenous peoples have to offer the wider world today – especially when it comes to sustainability and environmental stewardship – and indigenous knowledge and values can and should inform those of mainstream society. “We actually have some legitimate solutions,” Feaunati stated. “These might not [be expressed in] the way that scientists talk, but they are hidden in there. They are hidden in the stories, and the history, and the passions that [we] see in the stars, for example. There needs to be a mutual language – there needs to be a mutual understanding. And I know this will take a very long time, but I genuinely think that there is a future where indigenous people become the main source of information for how we can tackle climate change.” In the meantime, Feaunati and her peers throughout the Pacific Islands are determined to take action for themselves in the face of international inaction, to preserve their communities, and to strive for a sustainable future – whatever the odds. Trevelyan Wing is a Graduate Research Fellow at the Climate Institute. Founder of the Indigenous Youth Forum on Climate Change and former Stefansson Fellow at the Institute of Arctic Studies, he holds an MPhil in Environmental Change and Management from the University of Oxford. BBC News. “Deadly Tsunami Strikes In Pacific.” BBC News, September 30, 2009. http://news.bbc.co.uk/2/hi/asia-pacific/8281616.stm (accessed December 15, 2017). Bridges, Kent W., and McClatchey, Will C. “Living On The Margin: Ethnoecological Insights From Marshall Islanders At Rongelap Atoll.” Global Environmental Change 19, no. 2 (2009): 140–146. Hawaii State Legislature. House of Representatives. Hawaii Climate Adaptation Initiative Act of 2014. HB 1714. 27th Legislature, regular sess. https://www.capitol.hawaii.gov/session2014/bills/HB1714_.htm (accessed December 15, 2017). McNamara, Karen E., and Prasad, Shirleen S. “Valuing Indigenous Knowledge For Climate Change Adaptation Planning In Fiji And Vanuatu.” Traditional Knowledge Bulletin (July 2013). http://www.nab.vu/valuing-indigenous-knowledge-climate-change-adaptation-planning-fiji-and-vanuatu (accessed December 15, 2017). Page, Gabrielle. “Sustainable Development In French Polynesia: Environmental And Cultural Challenges.” Northeastern University Environmental Justice Research Center: Climate Justice Project (2013). http://www.northeastern.edu/nejrc/wp-content/uploads/Gabrielle-Page-Research-v3.pdf (accessed December 4, 2017). Secretariat of the Pacific Regional Environment Programme. Pacific Islands Framework For Action On Climate Change 2006-2015. 2nd ed. Apia: SPREP, 2011. Warrick, Olivia C. “Local Voices, Local Choices? Vulnerability to Climate Change and Community-Based Adaptation in Rural Vanuatu.” PhD diss., University of Waikato, 2011. https://waikato.researchgateway.ac.nz/handle/10289/5828 (accessed December 15, 2017). Wilson, Catherine. “Samoa’s Architects Look To The Past To Boost Climate Resilience.” The Christian Science Monitor, October 9, 2014. https://www.csmonitor.com/World/Making-a-difference/Change-Agent/2014/1009/Samoa-s-architects-look-to-the-past-to-boost-climate-resilience (accessed December 15, 2015). Yeo, Sophie. “Hawaii Passes Climate Change Adaptation Law.” Climate Home News, June 12, 2014. http://www.climatechangenews.com/2014/06/12/hawaii-passes-climate-change-adaptation-law (December 15, 2017).
. BBC News, “Deadly Tsunami Strikes In Pacific,” BBC News, September 30, 2009, http://news.bbc.co.uk/2/hi/asia-pacific/8281616.stm (accessed December 15, 2017); Catherine Wilson, “Samoa’s Architects Look To The Past To Boost Climate Resilience,” The Christian Science Monitor, October 9, 2014 https://www.csmonitor.com/World/Making-a-difference/Change-Agent/2014/1009/Samoa-s-architects-look-to-the-past-to-boost-climate-resilience (accessed December 15, 2017).
. Carinnya Feaunati, interview by author and Claudia Comberti, Paris, France, November 27, 2015.
. Catherine Wilson, “Samoa’s Architects Look To The Past To Boost Climate Resilience,” The Christian Science Monitor, October 9, 2014 https://www.csmonitor.com/World/Making-a-difference/Change-Agent/2014/1009/Samoa-s-architects-look-to-the-past-to-boost-climate-resilience (accessed December 15, 2017).
. Page, Gabrielle. “Sustainable Development In French Polynesia: Environmental And Cultural Challenges.” Northeastern University Environmental Justice Research Center: Climate Justice Project (2013). http://www.northeastern.edu/nejrc/wp-content/uploads/Gabrielle-Page-Research-v3.pdf (accessed December 4, 2017).
. Pascal Erhel Hatuuku, interview by Claudia Comberti, Paris, France, November 26, 2015.
. Karen E. McNamara and Shirleen S. Prasad, “Valuing Indigenous Knowledge For Climate Change Adaptation Planning In Fiji And Vanuatu,” Traditional Knowledge Bulletin (July 2013), http://www.nab.vu/valuing-indigenous-knowledge-climate-change-adaptation-planning-fiji-and-vanuatu (accessed December 15, 2017).
. Isso Nihmei, interview by Claudia Comberti, Paris, France, December 6, 2015.
. Fuluna Tikoidelaimakotu Tuimoce, interview by author, Paris, France, November 26, 2015.
. Hawaii Climate Adaptation Initiative Act of 2014, HB 1714, 27th Legislature, regular sess., https://www.capitol.hawaii.gov/session2014/bills/HB1714_.htm (accessed December 15, 2017).
. Sophie Yeo, “Hawaii Passes Climate Change Adaptation Law,” Climate Home News, June 12, 2014, http://www.climatechangenews.com/2014/06/12/hawaii-passes-climate-change-adaptation-law (December 15, 2017).
. Megan Kamalei Batangan, interview by author, Hanover, NH, June 5, 2015.
. Andie Kealohi Conching, interview by author, Hanover, NH, May 10, 2015.